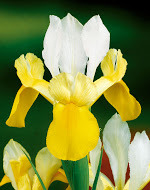 Dutch Iris are a staple of the perennial border or water features edge. This variety has yellow falls and striking white standards. 10 rhizomes/pkg.